2 months ago I thought that Petrov is an interesting alternative to my 2. … Nc6 (after winning 1 OTB game) with a clear, easy play and maybe I should add it to my OTB repertoire. Now, after playing a few Petrov correspondence games I have one draw as White and 2 heavy losses as Black (also another one is coming up), 0.5:3.5. As Black I get under attack right after a few moves out of the book. I, probably, don’t understand the strategy here and seriously think about giving it up, at least for some time. What about French defense? I always thought about it as some crowded, passive, etc. 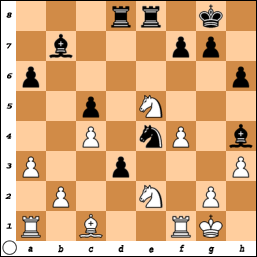 opening (if I am Black) – not my style at all, so I never played it as Black. 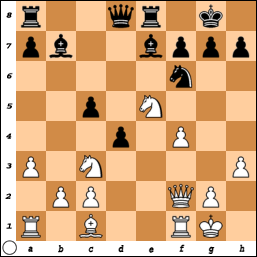 As White I played Exchange variation, because I considered other variations as tricky, with dangers to my d4 pawn, etc. But recently I decided that it’s a shame to play Exchange and I should learn something better. I started playing thematic games, all Tarrash. Because it’s a tournament I have to play Black too. 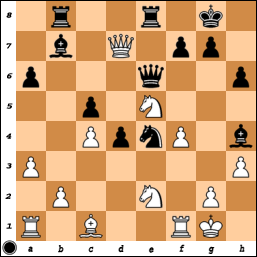 Suddenly, I have 2 wins as Black, as White – 2 wins are coming up (hopefully), and a chance to win in another one. So, it could be 4.5:0.5 or 5:0. I completely understand the ideas for both sides and feel comfortable, … weird. I consider this interesting, a sharp re-evaluation of the opening. I had it before, not to such degree, with Colle and Accelerated Dragon, that I don’t play anymore. Still Colle is not bad, just a bit boring and Accelerated Dragon just doesn’t give the expected results. Another one is Marshall attack for White, which I was afraid of before playing in a thematic tournament, now I consider it not frightening, but exciting. I played this Sunday the last game of the tournament. My opponent was the guy I knew, had 2 hard fought draws with him, rating 50 lower than mine. He started with 1. e4 and after 1… e5 2. Nf3 I knew he will play Scotch game (saw his games on the Web). I never played “rated” Scotch before. I didn’t quite like the positions I got online few times and didn’t want to play opening that somebody obviously knows better than me, so I decided to change decorations. This is higher than average in DB ( 40-43%), and 80% draws! 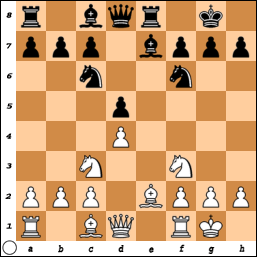 After several moves the position was symmetrical, boring and drawish. I remembered all bad play in this tournament and realized why GMs after that just make a draw in the next round. If he would offer it, I would agree right away. But then situation suddenly changed. 18. Ne2 Ne4 19. Qe1 Bh4. Bishops are becoming very dangerous. ( Crafty found 23. … d3 24. Nxd3 Nd2 25. Bxd2 Qxe2 26. Nf2 Qxd2 27. Qxa7 Qxf4 28. Rad1 Qg3 29. Rd5 Re2 30. 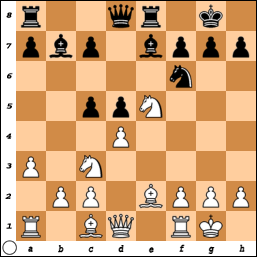 Qxc5 where White wins the piece for 2 pawns ). 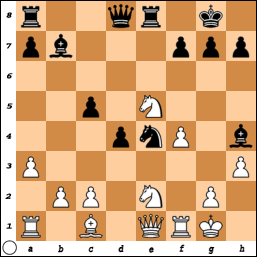 White resigned ( 27. Nc3 d2 ).